If you’re a wrestling fan reading this blog, you’re probably aware of the WWE Network, or Channel 9.99. Are you aware other wrestling promotions have similar offerings? 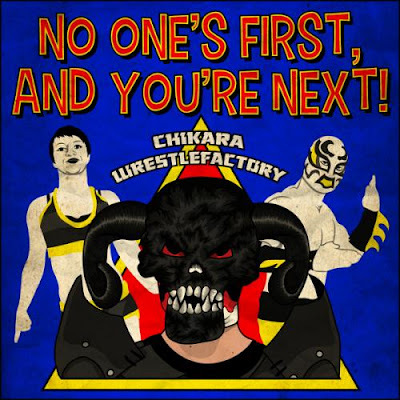 Long time readers won’t be surprised to know one of my favorites is Chikara’s CHIKARATopia. $7.99 a month is all it costs for unlimited access to the history and current on goings of Chikara. I’m not sure if they’re still offering a year for the price of 10 months but if they are, it makes the price even better. 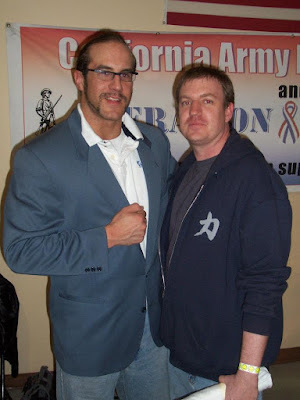 If you’ve never heard of Chikara or have only seen a small sampling of their product, I highly recommend at least checking out the CHIKARATopia free seven day trial. For WWE fans, this is a chance to see WWE stars like Luke Harper, Cesaro and Daniel Bryan among others early in their careers. For long time fans, watching the 1-2-3 Kid and Hakushi rekindle their feud from 1994 in the 2011 King of Trios is a blast from the past. 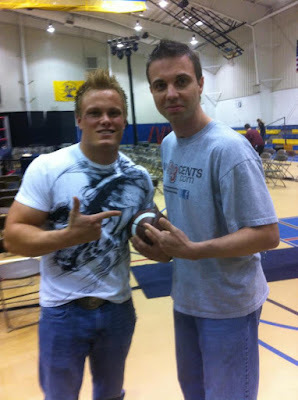 I have shouted praises for Chikara since day one of My 1-2-3 Cents. Going back and watching events from 2005, which is when I discovered Chikara, I can understand why other wrestling fans may have been confused by Chikara's style. It’s not necessarily an acquired taste, but it’s also not WWE. Seeing ants, time displaced knights, a guy with the face of a corncob and an actual dragon wrestling does take an open mind. One of my favorite aspects of the CHIKARATopia is being able to go back and re-watch events that are still having effects today. One of the points I use to promote Chikara’s greatness is their attention to detail in their storytelling. Any company who has been around for 16 seasons to not have any glaring holes in their story telling is impressive. Part of the appeal to the storytelling has to be attributed to the huge comic book influence in the stories themselves. Forget the Marvel Cinematic Universe or DC Films; I’ll take Chikara any day to get my dose of spandex clad heroes. In addition to the past season events, Chikara puts their current events up one month after their available for purchase. This translates to an on average of 6-7 week delay in keeping current with Chikara. A six-week delay for only $7.99 a month is not a bad deal. In addition to the full shows, Chikara has also been doing a monthly Power Hour live show once a month. I’m writing about the CHIKARATopia now because should you have any interest in checking out the company, this weekend is the best time. On Sunday (8/21), before SummerSlam, at 3pm EST, Chikara is presenting their first major live event. In all fairness, I do have to mention that during the Power Hour live shows, there have been some minor technical problems. Most of those problems have been with the audio while the video stream has been near perfect. Team Fire Ant vs. Team Hallowicked. Both teams will have 7 members. 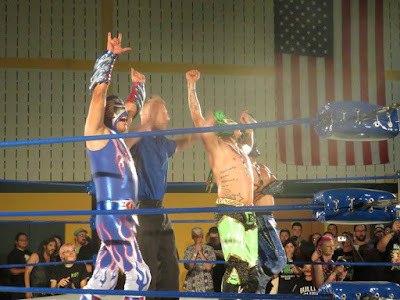 Hallowicked is the current Chikara Grand Champion and his team (I assume) are all the followers of the mysterious Nazbuldun. Princess Kimberlee vs. Heidi Lovelace: Former Grand Champion vs. former Young Lions Cup holder. Former friends who each have 2 points in title contention play. The winner gets a title shot, the loser starts over. Double Elimination Tag Team Title: N_R_G vs. Los Ice Cream vs. Devastation Corporation vs. Mustache Mountain. NRG are (or were) champions. Los Ice Creams had the Golden Opportunity to cash in for a title shot. Dev Corp. are the former champs who never got a rematch. 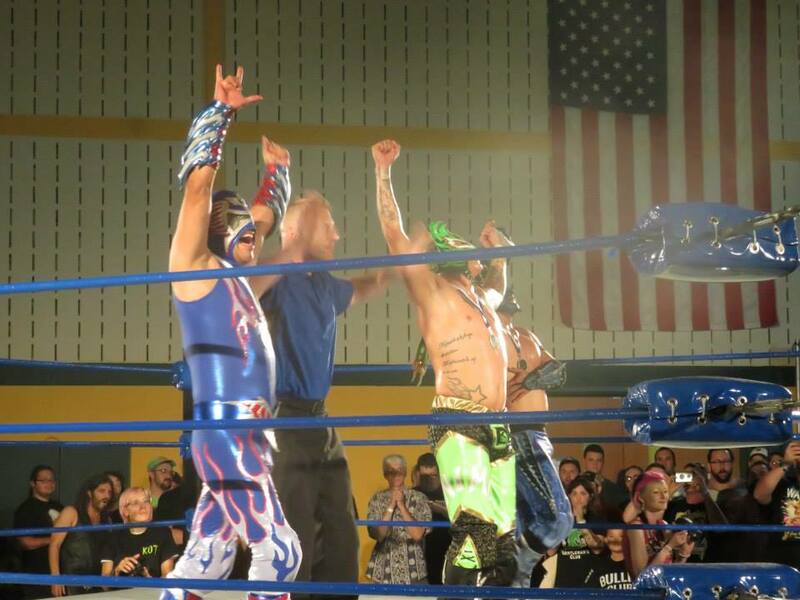 Mustache Mountain were the surprise hit of the 2015 King of Trios tournament. Eddie Kingston vs. Jakob Hammermeier. Kingston was the first Chikara Grand Champion. Jakob is the leader of the reformed B.D.K. Team Big Deal vs. United Nations. This is a trio’s match. Team Big Deal is lead by the wrestler formerly known as Hornswoggle. Ophidian vs. Hermit Crab. The master of snake style vs. the rookie crustacean. That’s seven matches, which should be a pretty outstanding show. There is no reason (other than not wanting to OD on wrestling this weekend) why you shouldn’t check out “No One’s First, and You’re Next” before SummerSlam. I’m pretty confident in saying, if you give Chikara a chance, you’ll stay subscribed to the CHIKARATopia.